The Creator is a masterpiece maker. The sweeping heavens and the bountiful earth and all that fill them reverberate with the reality of His creatively-complex desire to build meaning from nothing. The vast expanse of space and the tides of time are all infused with His finesse. Every atom and element mean more than science can ever discover, for it was spoken into being by the Being who alone is pure meaning. All are pieces of the Master’s masterpiece. The Architect of time and space stooped low to fashion a form that would be filled with His own breath, animated by His own Spirit. From the earth would be built the man who would take on the Creator's characteristics. The above verse is usually rendered with the term “image” instead of “shadow,” as I have done. 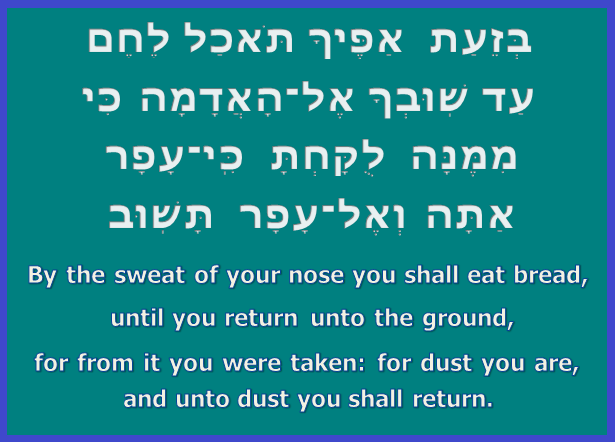 The reason for the unique reading shared here is that the Hebrew text literally says TZELEM “shadow,” and not the less-specific “image” found in just about every English translation. A shadow as a representation of the reality of a thing that can be; a portrayal of the true object. The Holy One made man in His shadow, so that His artisanal undertaking would truly reflect Him in a way that no other creation was granted. 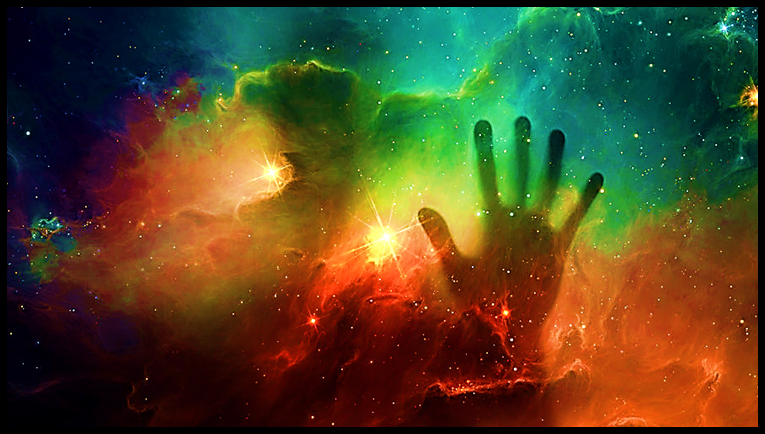 The framework of Adam was the infinite detail embedded in the Creator. The shadow of Elohim contains all the truth and reality possessed by the Holy One Himself, and it is in the intricacies of that awesome alignment that mankind had his origins. Not satisfied to merely make an image-bearer in His own shadow, He went on to create a special place for His representation to reside: the Garden of Eden. It is important to pay attention to the terminology used in the text about the creation of the Garden. The Word uses a term that is translated repeatedly in the Hebrew Scriptures as “plant,” which is NATA, but it actually means something else entirely: “Set upright / to erect.” This concept is applied to the act of planting, which is the setting of a seed that shall grow up, or the setting of an already-established plant. However, the term itself doesn’t actually mean “plant,” but more along the act of construction: “set upright / to erect.” It is even used in the book of Ecclesiastes 12:11 to speak of the setting up of nails in the work of carpentry. The Holy One therefore built the Garden in Genesis 2:8 as an ordered design, for an ordered purpose – to be an organic home for the man made from earth! The profaning of the Garden’s sanctity tore away the Presence of the Creator from His most beloved creation. Man, made in the shadow of the Almighty, experienced the withdrawal of the Presence, and was left to languish apart from His shadow in the harsh sun of a world no longer under his control. The anarchy of Adam cast him from the heights of holiness down to a deadly affinity with the dust from whence his form was wrought. The way to Eden was blocked; the holy Garden house shuttered to the one who shattered all fealty to its Builder. Thankfully, however, this horrific banishing of Elohim’s image would not be relegated to a failed work for the world’s Designer. For as much as the sin of Adam demolished the intimacy experienced between him and the Holy One, such a resounding judgment would not be final. The plan for restoration and rebuilding of what was torn down began to be known to mankind in careful presentations as time marched on. This strategy for the salvation of Adam’s seed took the shape of a modified version of what man originally knew. The Garden was a static, immovable place in time and space. Once sullied by man’s sin, it could no longer be entered by Adam. A similar creation – but manifestly different – needed to be built for man to return again to his original purpose. The procedure for man's restoration into the shadow of Elohim took the initial form of a kinetic meeting place – a mobile Holy House in which mankind could once more come into contact with the Erector of Eden’s Garden. The Tabernacle that was made in the wilderness of Sinai was the birthing of the desire of the Holy One to commune in intimacy once more with man. Although constructed in the midst of a sinful people, the Tabernacle would yet be exclusively other, inhabited only by the priests, to be approached by the people through their careful mediation. It stood for the desire of the Holy One to reconnect with those who had severed themselves from His goodness. This man Bezaleel is brimming with prophetic significance, for in him was the concept of how mankind would gain reentry into the Presence of the Creator - to return under the shadow of the Almighty. His very name is incredibly symbolic of what he would serve to be a part of by building the Tabernacle: Bezaleel means "In the Shadow of El," that is, "In the Shadow of the Deity." This points us back to the original pure creation of mankind in the Shadow of Elohim. The building of a new sanctuary for man was not enough – something had to be done in order to make it properly, and to deal with the issue of man’s sin, so that he could even partake of that new work. Bezaleel was chosen as the carpenter who would instigate the process of how the Holy One would restore mankind. In him would be found the character clues as to how redemption would be won in due time. In this manner, a careful consideration of the man is worth our time here. 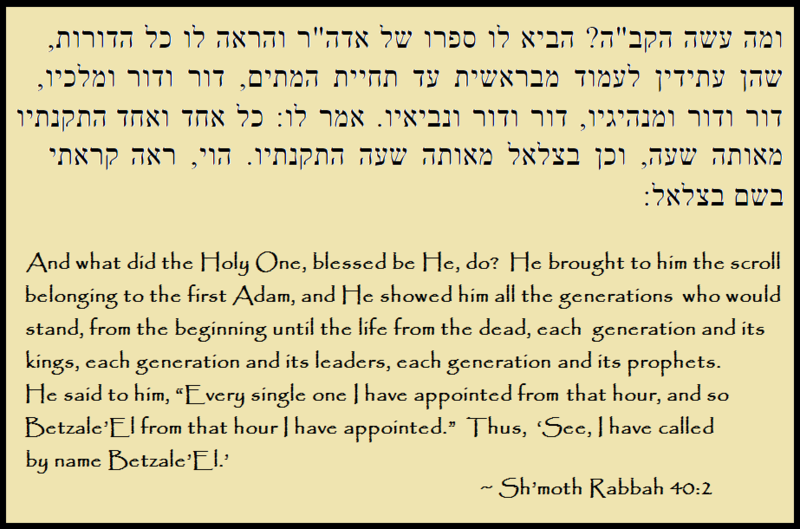 This excerpt displays for us an interesting notion: Bezaleel, along with other people who would play significant roles in history, had his name written in this special scroll which the Holy One had preserved from the beginning of time. The important factor to glean here is that Judaism views Bezaleel has having been marked for this very function of architect for the Tabernacle before the foundation of the world itself. 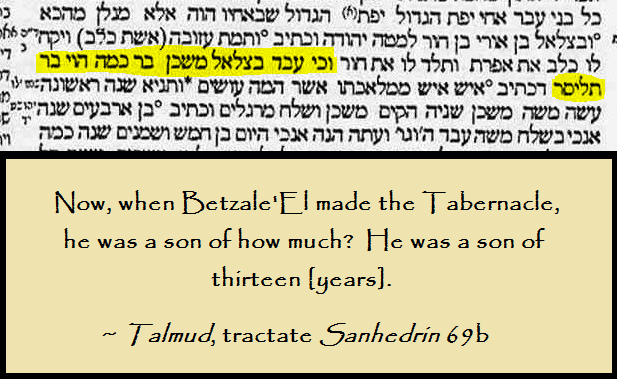 Another relevant detail that Judaism has preserved in regards to Bezaleel can be found in a lengthy discussion in the Talmud Bavli, in tractate Sanhedrin 69b, where a very complex computation of the age of certain Biblical figures is engaged in with the intent of showing that Bezaleel was thirteen (13) years old when the Spirit endowed him with wisdom, knowledge, understanding, and the ability to teach, and thus enabled him from that early age to be the carpenter for the Tabernacle. It is a strange thing for him to apparently have been filled at such a young age to do a work that would normally require years and years of highly-trained and skilled apprenticeship, but according to the math done in the passage in which this quote is contained, the Jewish commentators settled firmly on the age of thirteen for Bezaleel. The majestic and holy Tabernacle in the wilderness was therefore overseen in its construction and directly manufactured by a Spirit-filled thirteen-year-old boy - if we are to believe their math was correct! 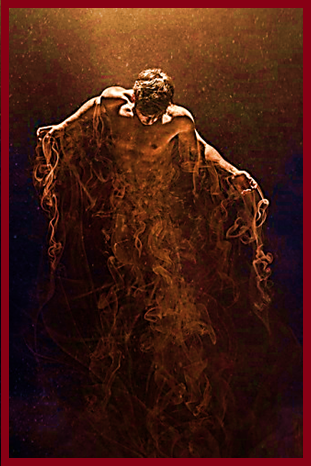 The Scriptural text does reveal to us that he had a direct apprentice – Oholiab, as well as many other artisans beneath him, and it was by their combined effort – lead by the young Bezaleel, that the Holy One’s desire for a physical sanctuary for His people was realized. In this can be made a powerful point: we are told to come to Him as a child (Matthew 19:14), and yet that does not mean in naivety, ignorance, or foolishness – as even a child can be endowed with great wisdom and insight. Age is no matter when the Spirit of the Holy One is empowering for His purposes. 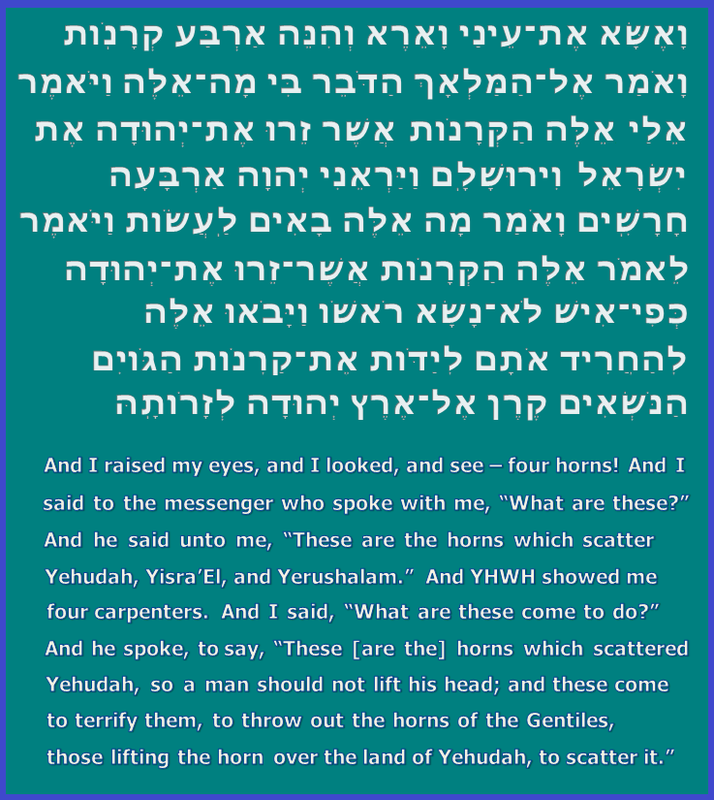 What is of importance here is that the Jewish teachers read the Hebrew term OTO “him” instead to mean “his letter.” This is a play on the word that the commentators are engaging in with the purpose of making the connection of the nature of Bezaleel’s being filled with the Spirit, for they then go on to quote from the Exodus 31 passage concerning his being filled with the Spirit, and mention being filled with Wisdom, Understanding, and Knowledge. This factor is then paired with phrases from Proverbs 3:19 and 3:20, which reference the Holy One’s direct usage of wisdom, understanding, and knowledge in the creation of the heavens and the earth. Essentially, what Judaism proposes is that the Creator utilized the letters of the Hebrew language to "build" creation from the atomic level into what we know and experience daily. 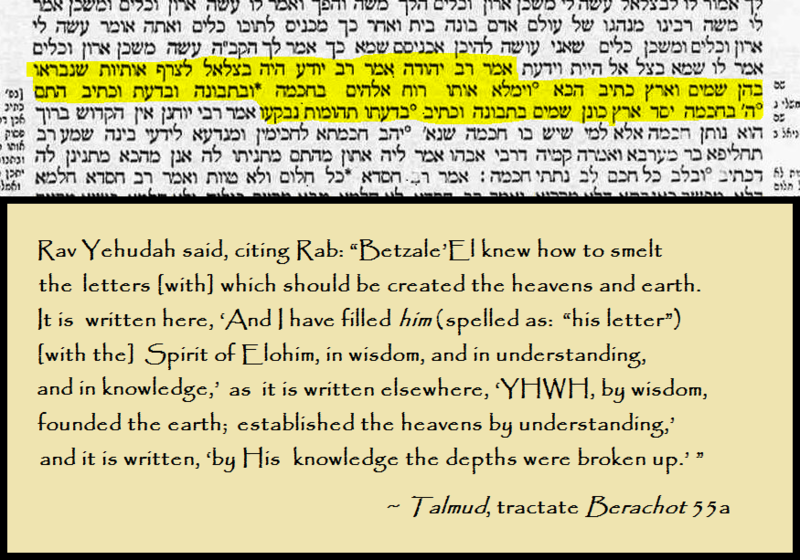 The idea that is thus presented in the Talmud about Bezaleel is his unique filling with the Spirit of Elohim granted him the unique ability to build the Tabernacle and its various vessels with the same type of special insight used by the Creator in His creation of the heavens and the earth. The concept presented by these Jewish commentators about Bezaleel is incredibly profound! 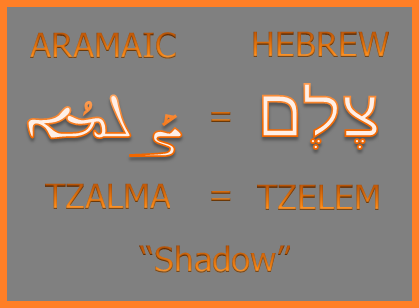 This concept is profound: The Aramaic text uses the exact same Semitic term as the Hebrew does for “Shadow,” altered only due to the subtle differences between the languages. This detail is strikingly significant, for it shows us that Messiah is the manifestation of what Bezaleel symbolized in his name: He is the Jewish man who is the “Shadow” of the Creator, the One who would build the Tabernacle! 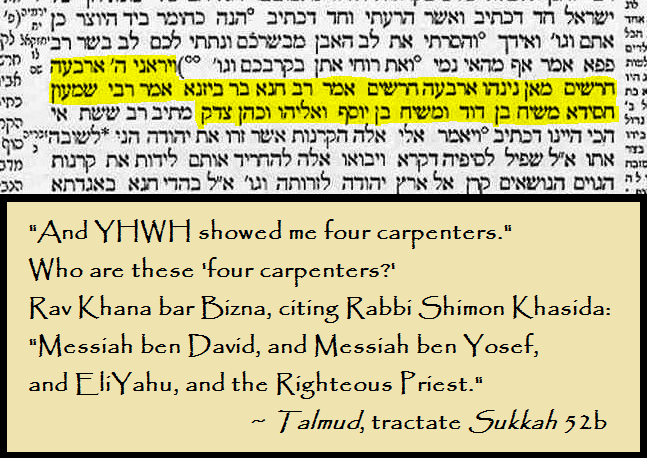 We know from Mark 6:3 that Yeshua’s profession before beginning His ministry in Israel was that of a carpenter. While this factor is typically brought up in regards to His death by crucifixion using nails and wood, and the dramatically-moving link to carpentry in that particular aspect, there is actually something much deeper in this detail of Him being trained to be a carpenter. The four carpenters are considered to be highly “Messianic” in identity: obviously, Messiah ben David and Messiah ben Yosef are Messianic figures: Judaism had a difficult time understanding how the obviously Scriptural sacrificial role of the Messiah could be reconciled with the also obviously Scriptural royal role of the Messiah, and in attempting to gel the concepts, they instead split the person of Messiah into two individuals – one who would die for the people (ben Yosef), and a second who would triumph for the people as king (ben David). The mention of EliYahu (Elijah the prophet) is also highly Messianic, in that Elijah is integrally-related to the return of the Messiah, and is a figure who himself took on a very Messianic-like persona in the eyes of Judaism. The Righteous Priest is identified elsewhere in the ancient Jewish work of Bereshit Rabbah 43 as none other than Melchizedek! Psalms 110 and the book of Hebrews goes into some length of the Messianic significance of that particular man, who served as priest and king. 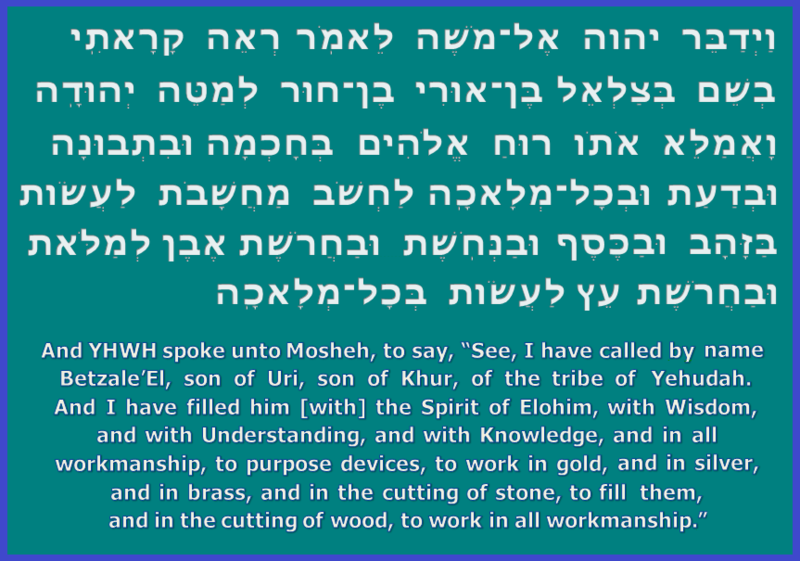 In all of this is the astonishing seldom-referenced reality that Judaism linked the Messiah to being a carpenter, and that is exactly what the New Testament writings show to have been the case for Yeshua! 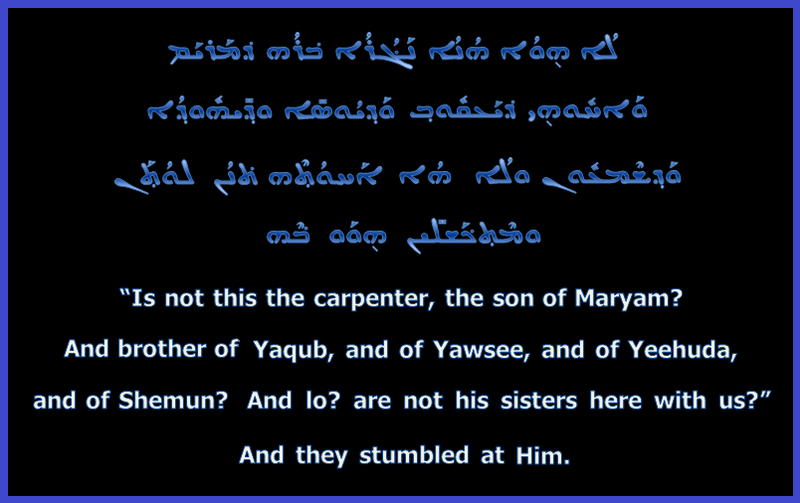 Just like Bezaleel, Yeshua was the carpenter who would build something in a way never experienced before by mankind. While Bezaleel experienced the limited filling of the Spirit of Elohim through wisdom, understanding, and knowledge, Yeshua the Messiah lacks no facet of the Spirit – it was instilled within Him without measure by the desire of the Creator. Like Bezaleel, Yeshua was an amazing Teacher who had under His tutelage men and women who desired to learn and mimic His miracles and method of living before the Presence of the Most High. The disciples were very much apprentices of the Spirit as they sat under the teaching of the only Man called to be the true Son of Elohim, just as Bezaleel was the only man who was ever called by name specifically in all of Scripture. These parallels show us that the building of the Tabernacle by the person of Bezaleel was the prototypical desire of the Holy One that would see realization in the body of His Son, Yeshua. He sat in their midst – teachers older than He, and who had studied the Torah of Elohim all their life, and yet were being schooled by a boy who should only just then be starting serious study of the Word. It made no sense to them, which is why the text says they were stupefied. Yeshua’s youth was no hindrance to His calling to show the wisdom of the Holy One to mankind. It was His nearness to the Spirit of Elohim that qualified Him to be a teacher to any man, regardless of age. The entire purpose of Yeshua was to build, to edify, and to restore what had been torn down in Eden. The Garden paradise erected originally by the Creator was brought crashing to the ground by the sin of Adam, and yet, as time moved forward, the heart’s desire of the Holy One was revealed; He wanted man to be near Him, to have that place of protection and intimacy once more; to be the image originally intended of him. Bezaleel and the Tabernacle he made were prototypes of that desire. 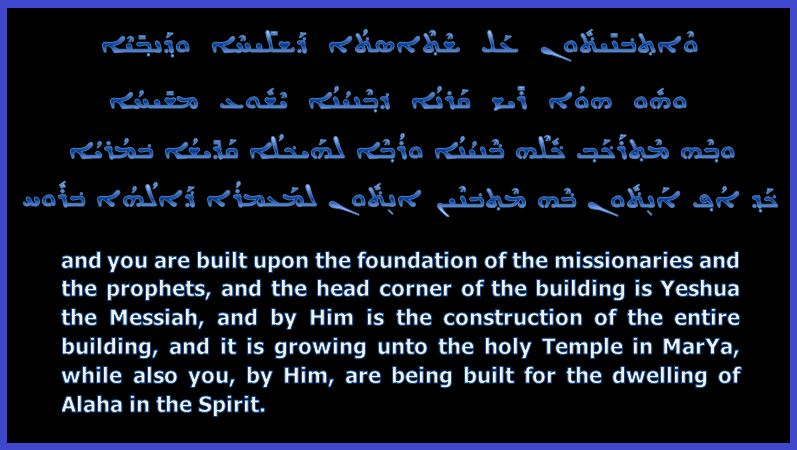 When the true means by which it would be obtained came upon the earth, man would see the wisdom of the Most High in making His Son the carpenter who would build a spiritual Temple upon the earth. 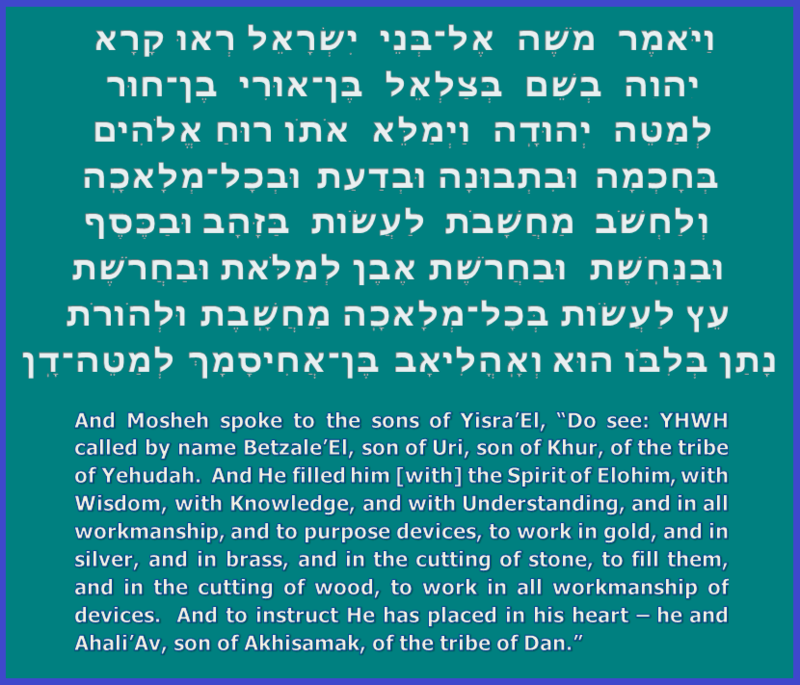 In this passage we see that Yeshua is the vehicle through which Yah worked to build all that we see in this world. This would only make sense in light of Judaism’s understanding of Bezaleel’s ability endowed by the Spirit to do the same majestic works for the Tabernacle as the Holy One did in creation, in that the Spirit was the same. 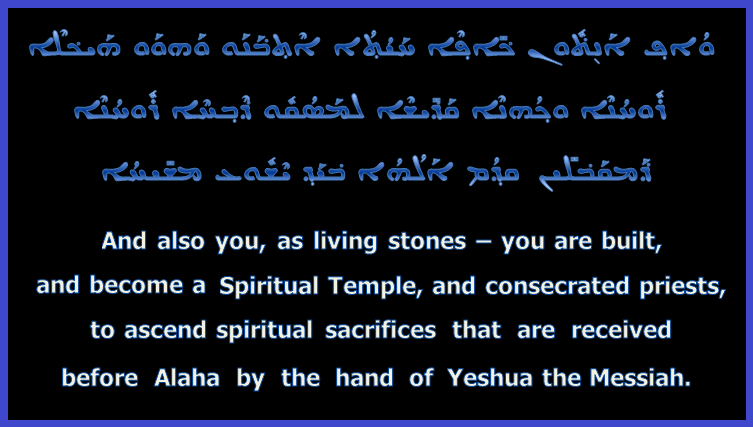 Yeshua knew the fullness of the Spirit, as Isaiah 11 explained above. It is no surprise, then, that His role was that of the Carpenter of creation through the power of the Spirit. 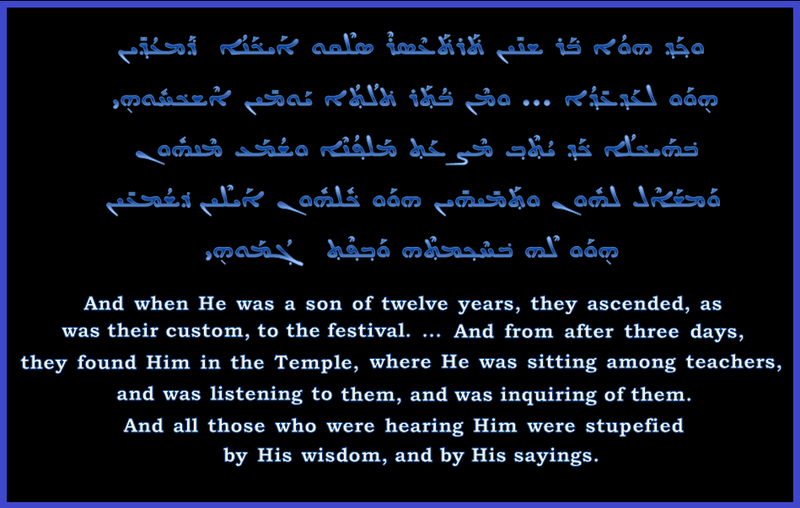 He is the true Word, the eternal utterance of the Most High, and so, like Bezaleel is perceived by Judaism to have been given the knowledge of how to use the letters to build the various aspects of the Tabernacle, thus also has Messiah utilized the power placed in Him to make and sustain all of creation. 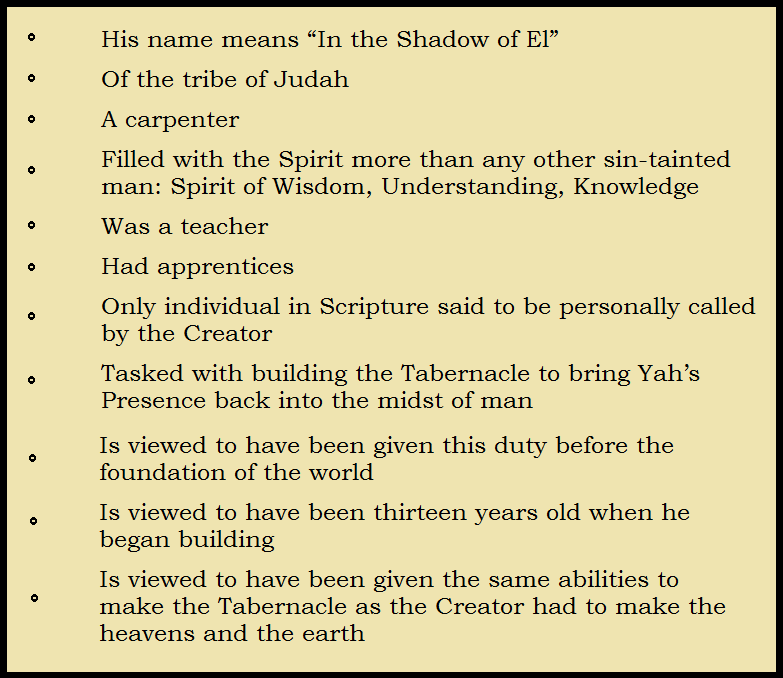 With this reading, we see that man is not made “in the shadow,” but rather, “by the Shadow,” and if read in this way, the verse instantly becomes a reference to the integral participation of Yeshua the Messiah in man's creation, whom Hebrews 1:3 calls the “Shadow” of Elohim’s Essence! Thus, we see the chain of thought established all the way from Genesis into the New Testament writings – the Shadow is responsible for the "carpentry" that built man! Through the death of the Messiah, we have the blessed ability to live in Him – in His shadow – in this world, being built into what the Holy One wants man to become. Through the Messiah the pure desire of the Creator for man to be made in His image is coming to pass. He has built a place for us to come to Him – in hearts restored from sin and death by His blood. In Him and by Him we are experiencing what it means to be in true intimate relationship with the Most High once more. We are more than just an inhabitant of that sanctuary, but are – by His very nature instilled into us – becoming that very sanctuary! 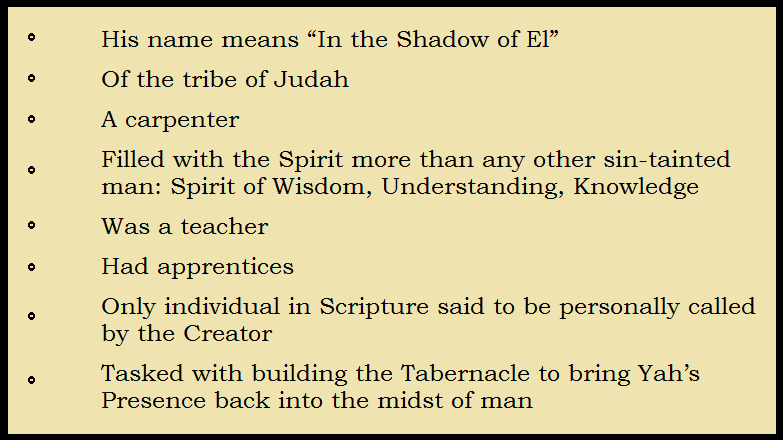 The Holy One removed the ability for man to be separated from His Holy House by using His Shadow - Yeshua - to be the carpenter building us into its very construction! In Yeshua, we can know what it means to be in the shadow of the Creator of all good things.